I haven’t poo’d in 18 months, but it’s not what you think!!! The low-down on my no-poo journey! Yup! The last time I poo’d was in December 2013!!! Used shampoo that is! And I think my hair looks pretty damn good! So what’s all this no-poo buzz about anyway? Basically, consumers have started to realize that there are lots of questionable ingredients in shampoo and conditioners, some of which are downright toxic, and can actually cause damage to your hair over time. No-poo means that you’ve gotten so fed up with chemicals that you’ve given up using shampoo at all. It’s quite the commitment and generally not the first course of action for most people. I was so tired of my hair breaking and excessive hair loss that I first chose to go low-poo before I went no poo. Low-poo means avoiding sulfates, silicones, and parabens (more about these ingredients below) in your hair care products. There was also some unfounded rumors a couple years ago that sulfates were causing cancer. These rumors helped lead consumers to seek out alternatives to traditional shampoo and thus shampoo companies have responded with the recent sulfate-free shampoo movement. The end result is there are a lot more options available to people who want to avoid using harsh chemicals in their beauty products but creative marketing has made it so that consumers have to be educated to know what to avoid. Sulfates – Sulfates are harsh detergents that are often added as lathering agents. Sodium Lauryl Sulfate (SLS) and Sodium Laureth Sulfate (SLES) are probably the most common sulfates and have gotten the most attention recently. They are powerful cleaners but work so well that overtime they can strip the hair of it’s natural oils (called sebum) causing damage (split ends and hair loss) and halting healthy hair growth. They are especially bad for color treated hair, as they can strip all that expensive dye off, as well as naturally curly hair, because they can make it extra frizzy. If you have allergies, eczema, or find your shampoo irritates your scalp but aren’t ready to give up shampoo just yet try switching to a sulfate-free shampoo. Is your shampoo low-poo? Here’s a list of ingredients that sulfates can masquerade as so you can be on the look out: Alkylbenzene Sulfonate, Alkylbenzene Sulfonate, Ammonium or Sodium Xylenesulfonate, Dioctyl Sodium Sulfosuccinate, Ethyl PEG-15 Cocamine Sulfate, Sodium C14-16 Olefin Sulfonate, Sodium Cocoyl Sarcosinate; Sodium Laureth, Myreth, or Lauryl Sulfate; Sodium Lauryl Sulfoacetate, and TEA-Dodecylbenzenesulfonate. **Be aware of SLS or SLES “from coconut” as this is a marketing ploy to make consumers believe it is a safer product. While the raw materials, or lauryl alcohol may be obtained from coconuts it is still combined with other chemicals to form the SLS or SLES and is a long way away from coconut oil! Sodium Chloride – Also known as table salt, sodium chloride is often added as a thickener to shampoos that contain sodium lauryl sulfate. While not a toxic chemical it can cause a dry, itchy scalp and should especially be avoided if you use keratin treatments on your hair as it can reduce the effectiveness. Diethanolamine (DEA) and Triethanolamine (TEA) – DEA and TEA are foaming agents often added to shampoos as sulfate alternatives to help create the lather consumers have come to expect in their shampoo. In addition, these ingredients are also found as thickening agents in mascara, foundation, facial cleansers, and body washes. But DEA and TEA can cause skin irritation and, when combined with nitrosating agents (nitrites), can cause a toxic chemical reaction. Currently cosmetic manufacturers are not required to list nitrites on their ingredient labels so it is next to impossible to know if a product contains them so it’s best just to avoid anything containing these ingredients. Is your shampoo low-poo? Other names DEA and TEA can be listed as include: Cocamide DEA or Cocamide Diethanolimine, Lauramide DEA or Lauramide Diethanolimine, DEA Lauryl Suphate or Diethanolimine Sulfate, Linoleaide DEA or Linoleaide Diethanolimine, and Oleamide DEA or Oleamide Diethanolimine. Silicones – Silicones, like Dimethicone, are often added to shampoos and conditioners because they make your hair appear shiny, soft, and easy to comb but can cause unwanted build up that can weigh your hair down. Pretty much you want to avoid anything that ends in “cone,” “conol,” “col,” or “xane,” unless it has the abbreviations “PEG” or “PPG” in front of them as these are silicones that are designed to be water soluable and do not cause the same kind of buildup over time as traditional silicones. I prefer to avoid silicones all together though. Are your shampoo and conditioner low-poo? Here’s a list of ingredients that silicones hide behind: Cetearyl Methicone, Cetyl Dimethicone, Dimethicone, Dimethiconol, and Stearyl Dimethicone are common silicones. Amodimethicone, Cyclomethicone/Cyclopentasiloxane, and Trimethylsilyamodimethicone are gentler silicones that will slow down the buildup that traditional silicones leave behind but are still technically silicones. And lastly, Behenoxy Dimethicone and Stearoxy Dimethicone are still technically silicones but are somewhat soluable in water. Polyethelyne Glycol – Also referred to as PEG/Polyethelyne or Polyoxyethelyne, polyethelyne glycol is a water soluable silicone often added as a thickening agent to shampooos that can strip the hair and skin of its natural moisture. Parabens – Parabens are used to kill bacteria and prolong shelf life in cosmetics including shampoo, conditioners, sunscreen, moisturizers, anti-aging serums, mascara, etc. They are the most commonly used preservative and unless your skin or beauty product specifically says “paraben-free” it probably has parabens in it. Despite their common usage, parabens can cause skin irritation, including dermatitis, rosacia, and other allergic reactions in people with sensitive skin. There’s even some rumors that they may be carcinogenic or have an estrogenic effect with continued exposure. Are your shampoo and coditioner low-poo? Look for parabens listed as methylparaben, butylparaben, propylparaben, isobutylparaben, ethylparaben, and polyparaben. Lanolin, Petroleum, and Mineral Oil – These ingredients are often added to shampoos and conditioners marketed for ethnic hair. However, they offer no additional moisturizing benefit and can actually weigh the hair down and prevent the natural oils (sebum) from being absorbed by the hair shaft, thus actually having a long-term drying effect making hair more brittle. Formaldehyde – Formaldehyde is often added as a preservative in cosmetics. However, it is a known carcinogen and can damage the skin’s natural oils causing dryness, flaking, dermatitis, and other allergic reactions. Excessive exposure to formaldehyde can actually cause hair loss. **Formaldehyde was an ingredient in the original J&J No More Tears Baby Shampoo, which has recently been reformulated as a result of an outcry by concerned parents. Propylene Glycol – Also known as antifreeze, propylene glycol is often added to shampoo and other cosmetics to prevent them from freezing during shipping and storage. However, it can cause skin irritations, allergic reactions and even alter the structure of the skin which may allow other chemicals to be more readily absorbed into your bloodstream. Alcohol – Almost all hair products contain alcohol of some sort but it can be drying in high concentrations. Stay away from products that list alcohol as one of the first four ingredients on the label. Synthetic Fragrance or Parfum – Synthetic fragrance can be a complex combination of thousands of chemicals that don’t have to be listed individually on ingredient labels. Many of these can cause skin irritation or allergic reaction. Best to just avoid products with fragrance or find products that use essential oils to add natural fragrance instead. Artificial Color – There is no reason other than aesthetics to add artificial coloring to cosmetics. Yet artificial colorants can cause skin sensitivity or scalp irritation. So now that you know why you want to avoid these ingredients, here is a little bit about my journey into the low- and no-poo realm. I first became interested in the low-poo movement after learning about how harsh SLS and SLES was on the skin. I had thrown out my facial cleansers and switched to castile soap as a body wash alternative so naturally looking into my shampoo and conditioning routine would be the next logical step. My hair had been dry, brittle, and damaged for years on end. I had chalked it up to my own laziness and the fact that I only tend to get my hair trimmed every 1-2 years (yes, you read that correctly…). In addition to dry, damaged hair I had been losing excessive amounts of hair for the last year or so before I started my journey. It was bad enough that I had even switched to really expensive, department store shampoos, like Aveda, in a desperate attempt to improve the condition of my hair and help prevent breakage and loss (and I’ve mentioned before how cheap frugal I am so you know this was huge!). After being incredibly disappointed that I didn’t get better results spending ridiculous amounts of money on what I thought was a natural line of department store shampoo and conditioner I swore I’d never spend that much again. So when I went on my quest to find a sulfate free shampoo I started looking for brands that I could buy at a drug or grocery store for half (or less) the price of what I had been spending. My quest led to me to discover the Organix line of hair and beauty products. I started using Organix Anti-Breakage Keratin Oil Shampoo and Conditioner because I liked that it didn’t contain SLS or SLES and had the keratin added as a natural hair strengthening ingredient to help prevent breakage. Overall, I really liked this product. However, it claims to be sulfate free but does contain Sodium C14-16 Olefin Sulfonate, which is technically a Sulfate. So in hindsight, it’s not actually Low Poo, hence my classification of Low(er) Poo. I felt duped upon this discovery, so I continued to my quest and traveled further down the no poo rabbit hole. **I’ve since learned that a better bet for drug-store low-poo brand is Shea Moisture. They have several formulations for different hair types all of which do not contain parabens, phthalates, paraffin, formaldehyde, popylene glycol, mineral oil, synthetic fragrance, petrolatum, sythetic color, or DEA and (bonus!) NO Animal Testing! In fact, we use the Shea Moisture Raw Shea Chamomile & Argon Oil Baby Head-To-Toe Wash & Shampoo with my daughter and love the way it lathers (makes a great bubble bath) and smells! I was already using Dr. Bronner’s Castille Soap as my body wash and in my research I had discovered that lots of people used castille soap as a no poo alternative to traditional shampoo so thought I would give it a try. While my hair certainly felt clean, the Dr. Bronner’s sadly left my hair flat and kinda dry. (I still use it as my daily body wash and have even converted my not-so-crunchy husband as well!) But, my favorite all natural blogger Crunchy Betty suggests combining Coconut Milk with Castille Soap to get the nice lather your used to with traditional shampoos and the extra moisturizing effect of the coconut milk. I personally haven’t tried it but if you’re up for it, check out her Sorta Poo recipe! * I’ve listed this as Oh Poo because since my journey started castille soap, as well as shampoo bars, have been reclassified from No-Poo because technically any kind of soap is well… soap. Just like you will learn below about other cleansing methods, soaps are very alkaline washing methods (some even more than baking soda) and still need to be followed up with an acidic rinse of some kind. **I cannot take credit for this witty renaming… The phrase Oh Poo came from here. When you finally get fed up enough and decide to take the plunge and go full on no poo you will see a lot of people recommend using a clarifying shampoo first. I didn’t use clarifying shampoo, although this is a step commonly recommended. Clarifying shampoo will help strip the excess silicones and other chemicals that have built up on the hair over time from using traditional shampoo and conditioning products. This is also supposed to help decrease the amount of time you go through the transition period. Since I started with low(er)-poo methods I felt I could skip this step. So what is the transition period? Basically it is a period of detox for your hair as it releases all the toxic chemicals and allows the buildup of silicones and other ingredients to fade away. The idea is you want the natural pH balance to return to your hair, a sort of homeostasis as it begins to produce just the right amount of natural oils, or sebum. We’ve done so much damage to our hair by constantly stripping away the oils that our hair compensates by over-producing oil to try to maintain it’s health. So it makes sense that when you stop stripping the natural oils that you would go through a period where your hair gets greasier. This is why many people give up on the no poo methods of hair care. But I promise, IT WILL GET BETTER! The trick is to give it time. My transition was about 3 months overall, which is a bit longer than normal and probably couldn’t been shortened had I known more about my hair type and found my ideal routine sooner. It may take several approaches before you find the right no poo method for you. Do the research, learn about your hair and what it needs (take the porosity test here), and most importantly don’t give up! Honey – I had read so many scary things about the baking soda/vinegar combo (probably the most common no poo method) damaging people’s hair that I was too afraid to try it initially. So I scoured the interwebz for other options. I had already started washing my face with honey at the point that I stumbled across the Empowered Sustenance blog about her DIY Honey Shampoo. I was initially concerned that the honey would make my hair super sticky but if it’s mixed right it doesn’t. The big turn off for me was having to mix up my “shampoo” before each wash because it can, and will, grow mold (which in hindsight isn’t a super big deal and I have to do that now anyway). My hair was super soft and shiny using honey but it got super greasy really fast. There is a big possibility that the grease factor was just my transition period. I’ll be honest, I haven’t tried it again since then (because raw honey is expensive), but it would probably work just fine now that I’m out of transition. 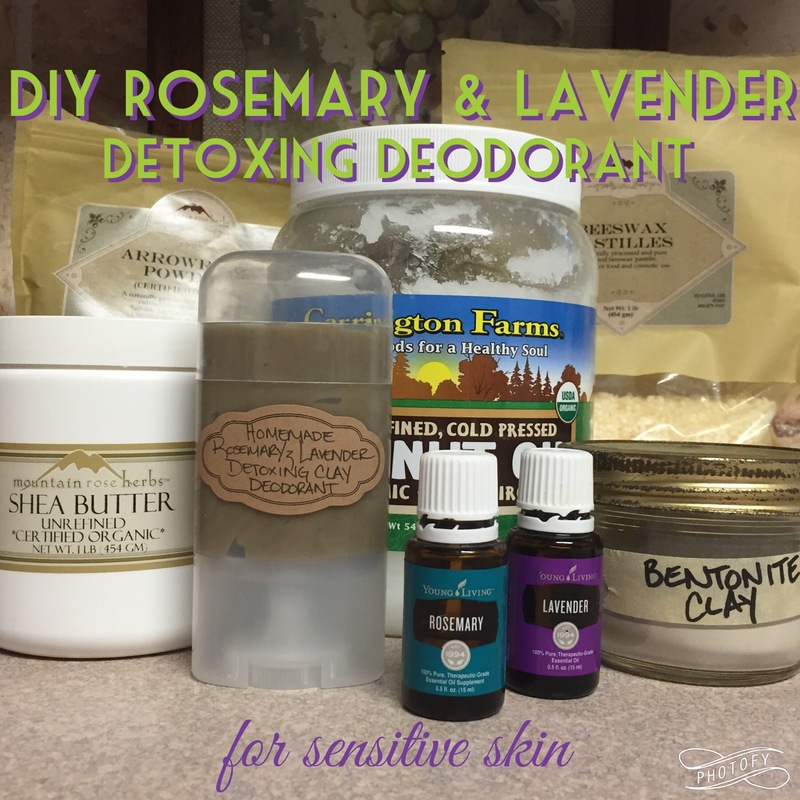 Bentonite Clay – A friend had given me some Bentonite Clay to use to make a face mask to help with my crazy hormonal acne that I had when I went off birth control so when I decided honey wasn’t the right choice for me I figured I’d give the clay a shot. Mommypotamus has a good blog on using clay for a mud wash and I used her technique. I honestly wasn’t impressed and only used the mud wash a few times. I felt like the clay was harder to get out of my hair and felt that it was pretty drying. My hair wasn’t as soft, shiny, or as easy to run my fingers through as normal. if you choose to go the mud wash route, try Rhassoul clay instead. BS/V – After several incredibly frustrating weeks of trying out the honey and the Bentonite clay I finally gave in and tried the baking soda/vinegar combo and eventually found the routine that works for me. I originally tried the method I’ve listed below and didn’t feel like it worked well while I was in transition. I then discovered the “paste method” where I would take 1 tbsp of baking soda and mix with just a touch of water until it formed a paste and would massage the paste into my roots. I found this much more effective at getting me through my transition but I’ve since learned that this can be really damaging to your hair. When I got pregnant my paste routine didn’t seem to be working as well and I switched to the method I describe below and it worked so much better! In hindsight, I wouldn’t do the paste method again, I would simply try to wait out my transition period. The key to any no poo wash is making sure that you restore the pH balance of your hair. Wash methods are mainly alkaline in nature so its important that you use some sort of acidic rinse to return your hair to its slightly acidic baseline. This seals the cuticle of the hair, so to speak, and helps the keratin lay flat on your hair resulting in soft, silky, and smooth hair! The most common acid rinse is vinegar. But I’ve also tried coffee and beer with some success. If you want to lighten your hair, lemon juice is also a good alternative. (See link at bottom of blog for more details on different wash routines and acid rinses). Apple Cider Vinegar (ACV) – This is generally recommended for people with dryer hair. My hair actually tends to be a bit oilier so I’m not sure why I originally started with ACV (it may have been because the smell is ever so slightly less offensive to my hubby) but I did and it seems to work well for me. But if you try it and you feel like it weighs your hair down, a switch to DWV may do the trick. *Some people will tell you to use the ACV “with the mother” (like Bragg’s) which basically means that the raw enzymes used to ferment the vinegar haven’t been removed. If I was drinking vinegar for health purposes I would totally make sure that I was using vinegar with the mother because it is full of gut friendly bacteria that help promote overall health but to rinse my hair that stuff is just way to expensive and seemed largely unnecessary. Distilled White Vinegar (DWV) – Often recommended for people with oilier hair. Baking Soda Hair Wash: 1 tbsp baking soda to 1 cup of water. One trick I learned is that if you have hard water, boil your water first. The baking soda will fizz a bit when the boiling water mixes in. I take a spoon and make sure that it completely mixes. Let cool then use to wash the roots of your hair, scrinching and massaging the scalp. I mix this up a few minutes before my shower and wash dishes or pump while it cools off. *If your head gets a little itchy or you feel like your scalp is too dry, try decreasing the amount of baking soda until you find a ratio that works for you. 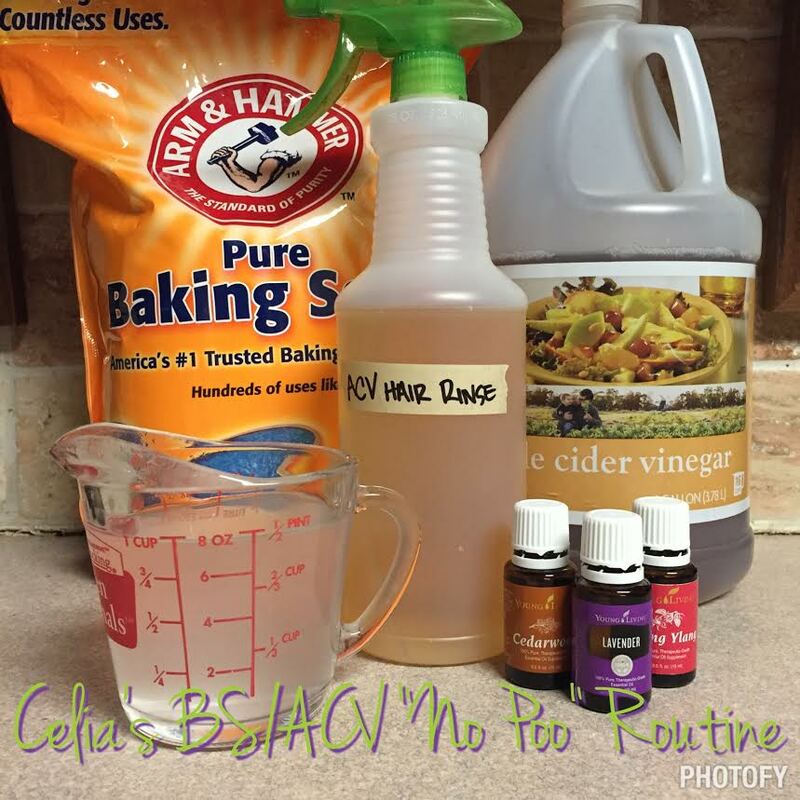 ACV Hair Rinse: I use a 22 oz spray bottle from the Dollar Tree. Fill 1/3 of the way with ACV and fill the rest up with water. I don’t boil this water, but I’ve seen some people recommend boiling it for this step too. Then I add 20 drops each of my essential oils (you can use less if you have a smaller spray bottle). Currently I’m using Lavender, Cedarwood, and Ylang Ylang. The Ylang Ylang completely covers up the vinegar smell (and my hubby has a nose like a bloodhound where vinegar is concerned so this is awesome)! *Check out my list below for details on which essential oils are good for your hair and pick your favorites based on your hair needs! I only use my hair rinse on the hair from my ears down. All the no poo fanatics will tell you this is wrong and that you should make sure to spray it on the top of your head too in order to restore the pH balance of your hair but I find that if I do this my hair gets greasier quicker, but be warned, my routine is technically “wrong.” Try spraying your whole head first and make the decision that works best for your hair. I leave my hair rinse spray bottle in the shower and use it until it’s gone and have never had any problem with mold growing in it. But I have seen people recommend only mixing up the amount that you will use at a time. * You can use any of these oils as part of a no-poo, low-poo, oh-poo, or poo-poo routine! Just add a few drops to your preferred rinse or conditioner! Lavender – Helps control hair loss, improves hair growth, and helps get rid of an itchy scalp and dry flakes. Peppermint – Great for an oily scalp. 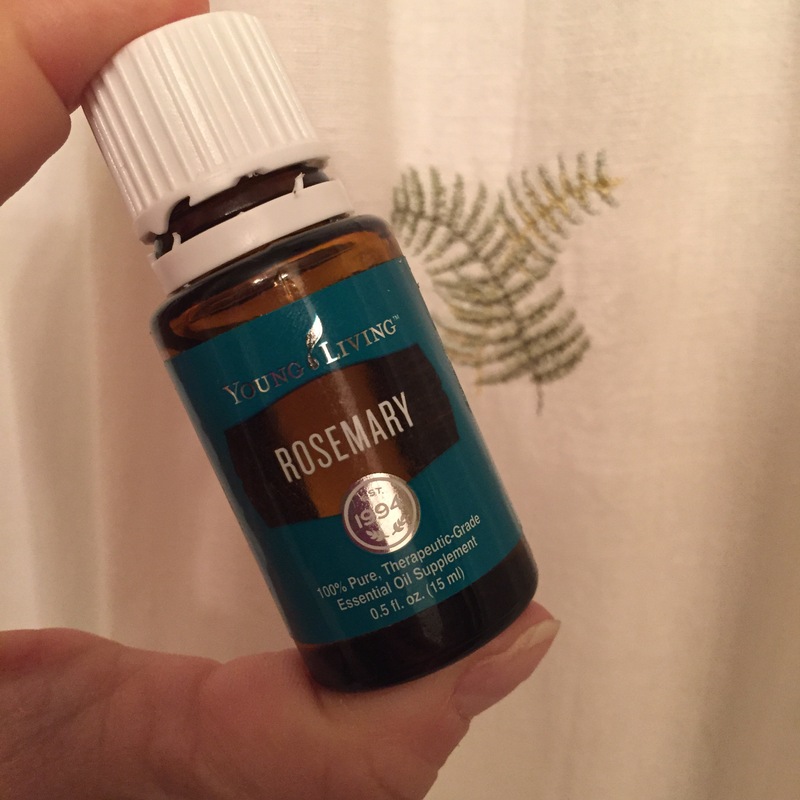 Rosemary – Encourages hair growth. Sandalwood – Helps restore moisture to hair and gives it a nice shine. Also supposedly helps combat premature greying of your hair! Tea Tree – Helps minimize flakes and prevents lice. Ylang Ylang – A natural hair conditioner that stimulates hair growth. Plus it smells lovely! Learn to love wearing your hair in a ponytail or braids – it will save your sanity while you are going through transition! You need to go as long as possible between washing to help your hair through transition. Especially with the BS/V routine you don’t want to wash your hair any more often than every 4 days. It was seriously painful going this long between washes and seeing how greasy and gross my hair looked in the beginning. Eventually I got to where I could make it 6-7 days between washes. Now that I’ve cut my hair and have a difficult time putting it in a ponytail I admit that I can no longer go that long between washes. I generally wash every 4 days now. My hair looks great for the first three days, the fourth it starts to get a little flat but is still totally presentable. I can go 5 days but my hair is looking pretty rough by that 5th day. 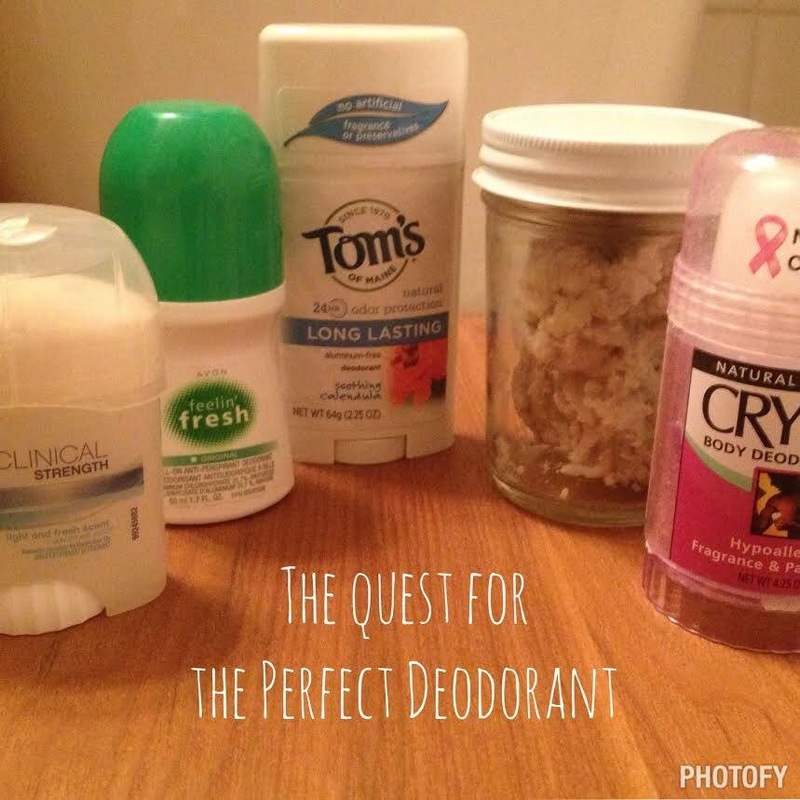 Dry shampoo – another trick that saved my sanity during transition. When your hair starts to get greasy on day 2 or 3 but you need to go longer between washes, use an old makeup brush to apply dry shampoo to your roots. I made my own using a recipe I found on the Wellness Mama blog (find it here). I used arrowroot and cocoa powder since I have dark hair. Blonds can get away with just arrowroot. And redheads can use cinnamon or red clay. Boar Bristle Brush (BBB) – A BBB is a natural bristle brush that is used to help distribute the natural oils (sebum) along the length of your hair. This is technically the best type of hair brush to use, but I find that it makes my hair really staticky so I don’t really use it much anymore. But when in transition this is really important because it can keep the shaft of your hair moisturized and keep the sebum buildup from being quite so noticeable. The Morocco Method is what is frequently recommended for brushing with a BBB. Check out a how to video here. No Poo Wash Methods – a pretty comprehensive list of the no poo wash methods out there. Want to take it even further, check out Water Only (WO) and Sebum Only (SO) methods of hair care! Another great, non-Facebook, resource is the No Poo Method website. It has a great list of FAQ’s and describes a variety of methods and problem solving approaches to common pitfalls with the no poo method. Do you no poo? Share your method below to keep the conversation going! Categories: DIY Personal Care and Hygiene | Tags: baking soda, bentonite clay, boar bristle brush, cedarwood, chemical free, dry shampoo, essential oils, frankincense, hair care, honey, lavender, low poo, natural lifestyle, natural living, no poo, non-toxic, peppermint, rosemary, sandalwood, tea tree, vinegar, ylan ylang, young living | Permalink.